Have a balloon flight voucher? Aerosaurus Balloons have provided champagne hot air balloon flights to over 85,000 passengers over the most awe-inspiring areas of the South West of England during a quarter of a century as a leading UK ballooning company. We are the largest hot air balloon company in the West Country and have attracted passengers from all over the world to fly with us. From seven to one hundred years of age, every individual customer we have flown has found it to be the experience of a lifetime. Our Pilots have many years experience and have flown all over the world. They will ensure you have a safe and memorable ride in some of the most beautiful locations in the South West. 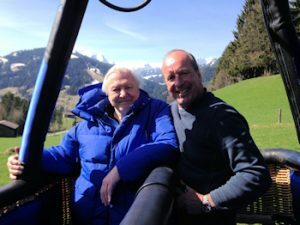 Chief Pilot, Clive Bailey, recently flew Sir David Attenborough at high altitude over the Swiss Alps for his opening sequence in the new series of Planet Earth II. Our balloon flights take off from handpicked locations in Somerset, Dorset, Wiltshire, Mid and East Devon, South Devon and Cornwall, offering some of the most spectacular views in the UK. Float peacefully over stunning countryside, towns, villages and cities, taking in the sights at heights of 500ft – 3000ft. Balloon flights take place at dawn and dusk and are a wonderfully relaxing way to see your local area or explore new parts of the South West. You can travel alone, with a loved one or as a group – Aerosaurus Balloons offer group flights with other people and exclusive balloons. Enjoy watching the sun rise or set from a unique perspective with 360-degree uninterrupted views and to finish off, celebrate with a glass of chilled Champagne! We are members of Balloons Over Britain and are one of the most trusted ballooning companies in the world. This website offers all the information on ballooning that you could ever need, from flight information and prices for both daily scheduled flights and private, to exclusive flights information, the latest ballooning news, a gallery of in-flight photos and our balloon flight availability. We are able to offer dawn & dusk balloon rides for individuals or groups. Bookings can be made via our online shop or through our booking office. Do not hesitate to contact us for further information. For balloon rides in Bristol, Bath and South Wales please contact Bailey Balloons.